While “Cool Down” by Aldubb feat. Longfingah is still keeping the massives dancing at reggae- and dub-sessions worldwide two new tunes on the electrifying steppers-riddim by Aldubb follow on vinyl now. The first one is “Iron A Wail” sung by the great jamaican singer Teacha Dee who has recently recorded with Symbiz Sound f.e. and was on stage at the latest Reggae Jam Festival among other shows. “Iron A Wail” has a cool & gentle flow combined with a deep message. 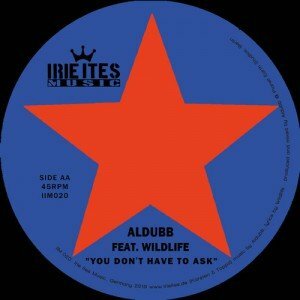 “You Don’t Have To Ask” by another great jamaican singer and songwriter, George Scott aka Wildlife, is the track on the flipside – deep message as well, heavy bass and a very unique deep voice! Big tune! Voice A Thunda!